Leah Hogsten | The Salt Lake Tribune Brigham Young Cougars defensive back Chris Wilcox (32) brings down Utah State Aggies running back Darwin Thompson (5). Utah State University defeated BYU, 45-20, at Lavell Edwards Stadium in Provo, Friday, Oct. 5, 2018. Provo • BYU head coach Kalani Sitake and offensive coordinator Jeff Grimes acknowledged Monday that they “could have done things differently” and mistakes were made by coaches and players alike in the final minute of BYU’s 21-16 loss to Boise State last Saturday. Both men also said that if BYU had executed better in the first 58 minutes of the game, the outcome wouldn’t have come down to the final play. Freshman quarterback Zach Wilson was sacked at the Boise State 4-yard line as time expired and the Broncos escaped with their fifth straight win over BYU at Albertsons Stadium. 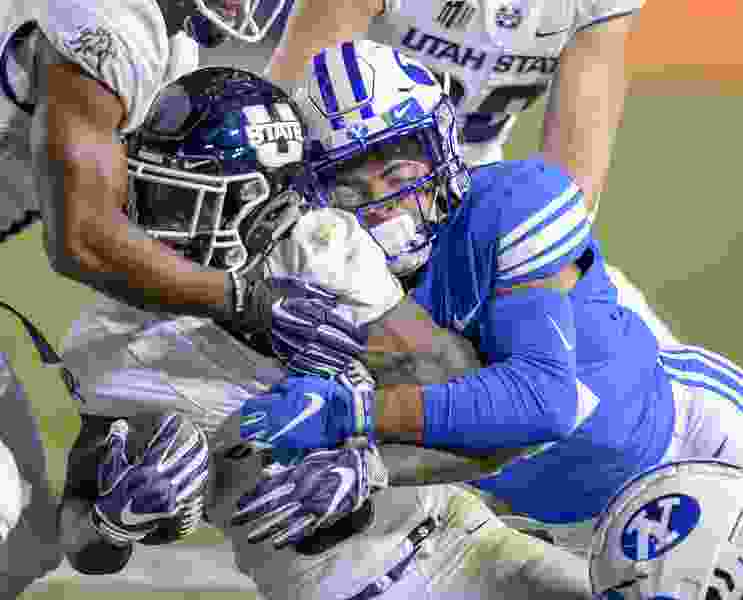 Sitake and Grimes said the plan on the last play — which began with seven seconds remaining — was for Wilson to make a quick slant pass to Talon Shumway or throw the ball away. Grimes said on his “Coordinators’ Corner” program Monday that if the quick pass didn’t work, he already had another play in mind. Wilson said immediately after the game he made a “freshman mistake” and held himself accountable for not throwing the ball away. “Your natural reaction when someone is in your face is to get out of the way,” he said. Indeed, the freshman threw for a career-high 252 yards and outplayed Boise State senior Brett Rypien, who threw for 214 and a touchdown but was intercepted by BYU’s Michael Shelton. As to why he called several running plays after BYU reached the BSU 5-yard line with less than a minute remaining, Grimes said the 59-yard screen pass to Matt Hadley changed their approach completely. “I thought, ‘let’s go back to our run/RPO package, which had been the most efficient thing that we had done all game,’” he said. As for the questionable clock management in the final minute, including the failure to call a timeout to keep precious seconds from burning off the clock, Sitake said he didn’t think it was going to take so long to get the play off on first-and-goal from the 5. The coach confirmed that junior cornerback Chris Wilcox sustained a lower leg injury in the game and is out for the remainder of the season. “It is not a surgery required injury, but he will be out, even for a bowl game, with the timing it will take for it to heal,” Sitake said. Wilcox had started at right corner in every game this season. Redshirt freshman D’Angelo Mandell is listed as the new starter in the depth chart released Monday. Sitake said that two players who might have been redshirted this season — freshmen Isaiah Herron and walk-on Jaylon Vickers — will probably have to play now. Other freshman candidates to get more playing time are Keenan Ellis and Malik Moore, who has been moved to safety.